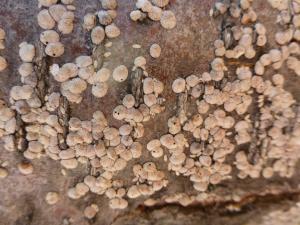 Scale insects are sap-feeding insects named for the scale or shell-like waxy covering that conceals their bodies. In Iowa, most species of shade trees, fruit trees, and ornamental shrubs are subject to scale insect attacks. Scale insects can weaken and even kill trees, shrubs and houseplants, but in general, complete loss of the plant is rare. immature scales are beige and to the right. Actual size 5mm. 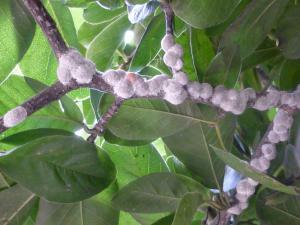 Depending on the species, scale insects may be found on plant stems, twigs, trunks, foliage, or fruit. Most scale insects are small and inconspicuous. The size of scale insects ranges from 1/8 to ½ inch. Color, shape, texture and other features vary with the species. • Soft scales produce a soft, thin, cottony, powdery or waxy layer over themselves that cannot be separated from the insect body. These scale insects often produce copious amounts of honeydew. • Armored scales have a hard, shield-like cover composed of shed skins and wax that conceals the body but is not attached to the body of the insect. Scale insects feed by sucking sap from trees and shrubs through piercing-sucking mouth parts. Sap feeding by scale insects may cause yellowing or wilting of leaves, stunting or unthrifty appearance of the plants, and eventually death of all or part of the plant when infestations are heavy. Weakened plants may lose vigor and become more susceptible to injury caused by drought, severe winters, attack by other insects (such as borers), or infection by diseases. by magnolia scales soft scales. While feeding, soft scale insects excrete a sweet, sticky substance called honeydew. Honeydew is a mixture of undigested sugar and water passed through the insect's digestive system and deposited onto leaves and stems. Honeydew may make the plant appear shiny and wet and also attracts flies, ants, bees, and other insect scavengers. The honeydew may encourage a fungus called sooty mold that gives the plants a characteristic black, “sooty” appearance. 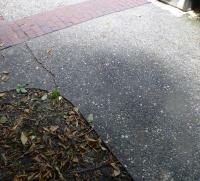 Honeydew can foul sidewalk, cars, and houses beneath scale-infested trees. 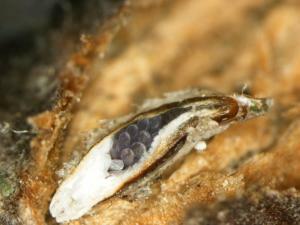 Eggs underneath a female scale. nymphs, emerge. Nymphs have legs and antennae and are called “crawlers” because they walk away from the maternal scale to settle at new feeding sites. For most common scales, this is the only stage that crawls about on the plant. When the crawlers arrive at a suitable location, they insert their mouthparts into the plant, and begin to feed on the plant’s sap. The shell or scale characteristic of the species develops soon after feeding begins. The legs and antennae of most species are lost as the nymphs grow. Nymphs and adult females for most species remain at the same location for the rest of their lives. Adult males are tiny, flying, gnat-like insects that fly to new females for mating. Scales may go through one or more generations each year. Scale insects are difficult to control because the waxy or cottony covering serves as a protective barrier to traditional contact insecticides. However, a pest management program that incorporates natural, mechanical, and/or chemical controls (as described below) should provide satisfactory control of most scales on most ornamental plants. Parasitoids (small parasitic wasps) and predators (such as lady beetles) can attack and significantly reduce scale insect populations. Other natural mortality factors (such as adverse weather) may influence populations, causing year-to-year variations. The presence of biological and natural controls can keep scale populations low, so insecticide treatments are not needed. Observe closely the progress of scale infestations. If scale numbers decrease (or continue at a low level), do not treat. Rapidly increasing scale populations and/ or heavy infestations should be treated as outlined below. Plants produced for sale must be treated so they remain pest free. Mechanically removing scale insects may be practical in certain situations such as small infestations on houseplants or on small trees and shrubs. Heavily infested stems can be pruned out and discarded to reduce scale populations. Insecticide applications may be warranted when natural enemies and mechanical controls are not sufficient to prevent plant injury. There are three chemical control strategies for treating infested trees and shrubs: spray dormant oil prior to bud break, apply a contact insecticide in summer when the crawlers are active, or use a systemic insecticide. Dormant Oil: A thorough application of horticultural oil according to label instructions just prior to bud break in late March or early April (while the plant is dormant) may control scale insects on trees and shrubs. Effective control requires a thorough treatment of all aboveground plant parts. 1. "Calendar Approach:" Spray at the “average” time eggs have hatched in your area in the past, according to published literature. These approximate dates are not always accurate because of year-to-year weather fluctuations. 2. "Pest Development:" the life cycle stages of the insect, such as egg hatch can be estimated for some species by adjusting the average expected timing for current weather conditions. 3. "Plant Development:" Year to year weather variation in weather and insect development can be estimated by the use of phenology (the known influences of weather variations on plant and animal rhythms). By watching known phenological indicator plants you can accurately predict when a particular scale's eggs hatch will hatch in your area. Note that the indicator plants are not infested with the scale in question. 4. Visual Inspection:" Carefully examine the infested plant to see if crawlers are present or shake a branch of the infested plant above a sheet of white paper and examine the paper for crawlers. Alternatively, place double-sided tape around the twigs or branches in affected areas of the plant when crawlers are expected. The tiny insect’s bodies get stuck in the adhesive. A magnifying glass can help with identification. Most home lawn and garden insecticides found in garden stores (including insecticidal soap and horticultural oil) are appropriate for use on ornamental trees and shrubs in Iowa. Check the pesticide label of each product to make sure that the type of scale and the name of the host plant are listed for that product. Always read and follow label instructions on mixing, usage and application safety. Old scales may remain harmlessly on the plant for some time after the death of the insect. To evaluate the effectiveness of treatments, slide your thumb across a group of scales. If scales are dead, they will be hollow and the coverings will flake off easily. Living scales will leave a colored, wet residue on your thumbnail. Systemic insecticides are injected into the plant or are applied as a foliar spray, drench or soil injection under an infested tree or shrub. Systemic insecticides circulate through the plant and can control both crawlers and adult scales with less impact on natural enemies and less risk of pesticide drift. However, systemic insecticides can be time consuming and expensive and they may be effective only on those scales infesting the leaves or those that are actively producing honeydew.